Very powerful email obtained through FOI before the transparency crackdown by corrupt BC Ministry of Education. Steve Cardwell calls the issue of Mr Roy (who was making contract with news media to report the conduct of a school principal that did bad stuff) a "known issue". Remember it was Cardwell & Ciarniello from the Vancouver School Board that attacked Mr Roy with a Sec.177 in an attempt to silence & intimidate Mr Roy from telling his story. 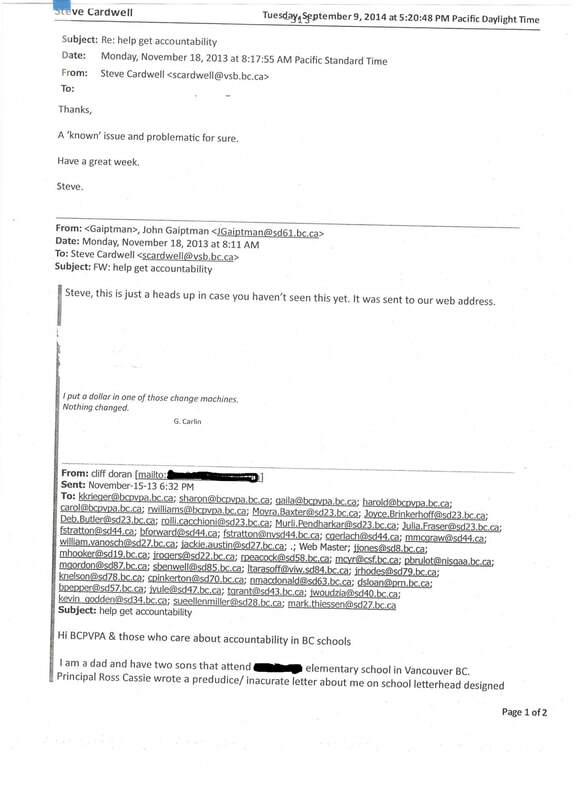 Not one document out of over 1000 pages shows Mr Roy ever being a physical threat in any way... What is even more chilling in this email, is the cozy connection between John Gaiptman (who has hijacked BCCPAC that was once an independent watchdog run by parents) & Steve Cardwell who was Superintendent of the Vancouver School Board. Special note : all through the 1000's of FOI documents are famous little quotes that seem out of place & more related to the topic, as in this case "nothing changed". Click here to see some connecting documents - & here also. View Sec.177 petition here & audio evidence here. Notice Kip Krieger's name in email chain and on audio !